Simple volume, i.e. volume consisting of one disk partition. Mount point – volume mounted as a sub-folder on NTFS-formatted volume. AES (Rijndael) – 256-bit key. BestCrypt Volume Encryption utilizes XTS Encryption Mode with all encryption algorithms listed above. XTS Mode is specially designed for applications working on disk sector level and more secure than other popular modes used earlier, like LRW or CBC mode. BestCrypt Volume Encryption supports hardware tokens Aladdin eToken R2 and PRO as a secure hardware storage for encryption keys. With hardware token users get two levels of protection for encrypted data, because in addition to password it is necessary to connect small hardware token where encryption key is stored. BestCrypt Volume Encryption provides Secure Hibernating. If user encrypts volume where Windows stores Hibernate File, BestCrypt Volume Encryption encrypts all write operations when Windows goes into Hibernate state and decrypts read operations when the computer wakes up from Hibernate state. Since pre-boot authentication is necessary at wake-up time, only the user who knows the proper password (and has hardware token, if used) can run computer from Hibernate mode. Secure Hibernating is a functionality that must be implemented in such software as BestCrypt Volume Encryption, otherwise all data written at Hibernate time (together with encryption keys) appears on disk in opened decrypted form. 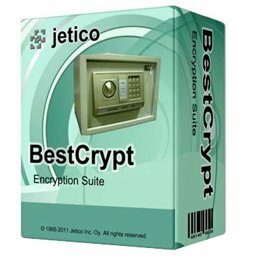 As well as Hibernate File, BestCrypt Volume Encryption encrypts Windows Crash Dump Files. Windows writes files in a very special way, because when a crash occurs, regular disk write operations cannot be used. Without encrypting Crash Dump Files the security level of the software were significantly lower, because the files can store a snapshot of memory together with encryption keys on disk in opened decrypted form. BestCrypt Volume Encryption supports a number of rescue functions allowing users to decrypt volumes if a serious disk crash occurs. BestCrypt Volume Encryption Plugin for BartPE bootable CD/DVD is available. The user can boot computer with encrypted volume using the bootable CD/DVD and run BestCrypt Volume Encryption commands directly from the CD/DVD. The functionality can be extremely useful for various recovering purposes. If some folders on encrypted volume are shared for network access, BestCrypt Volume Encryption will automatically restore the shares when the user mounts the volume. The software stores information about shared folders in encrypted form. BestCrypt Volume Encryption allows optional mounting not system volumes automatically before computer starts loading operating system (“Mount at Boot Time” option). The software allows per-user setting for mounting not system volumes when the user logs on (“Mount at Logon” option). The software has an option to hide drive letters for volumes that are not mounted. The option allows avoiding accidental formatting not mounted encrypted volumes. BestCrypt Volume Encryption can display contents of physical sectors, relatively to physical disk or logical volume. The sectors’ data can be saved to file or restored from file.